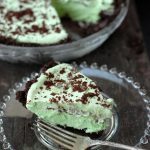 Grasshopper Pie is a vintage No Bake pie recipe made with chocolate cookie crumb crust, and light minty frozen marshmallow Creme de Menthe filling. This refreshing dessert is great all year round. Easily made gluten-free or regular. A girlfriend of mine hosted a gathering with a posh, true-to-era ambiance to celebrate the new TV series ‘Pan Am’. 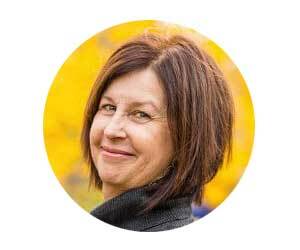 She and two other ex Pan Am flight attendants were in the wings to fill in on all the inside scoop. The show dipicts the era of elegance in travel when people dressed up to fly, customer service was a priority, no one cared how many ounces of Prell shampoo was on your person, nor were peek-a-boo x-rays required to see if you might be packin’. I recall Pan Am and TWA to have the cache as the luxe airlines that went anywhere in the world. As a contribution to the gathering I was asked to bring a dessert. 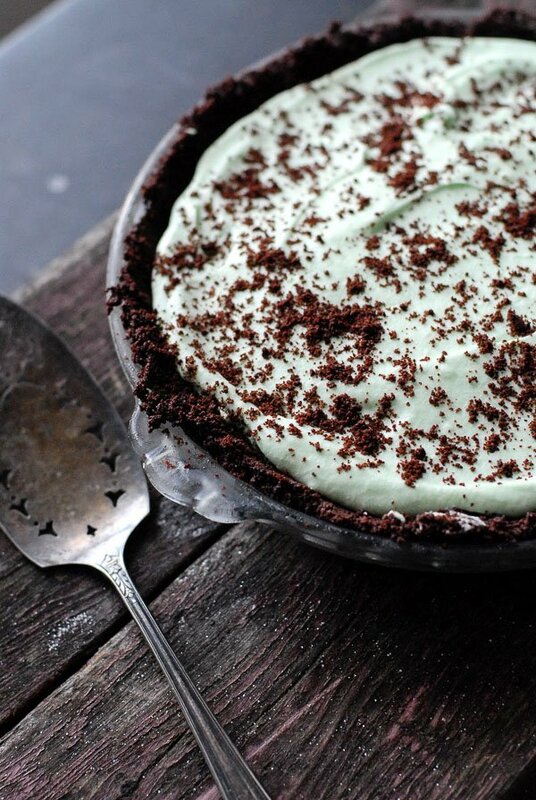 For whatever reason I immediately thought of Grasshopper Pie. To me it was one of those era-specific dishes that went away as the age shifted to a new tide. I think it must have been looked at as fairly gourmet, sophisticated, and very clever at the time. She served Cherries Jubilee, another classic dessert that has stood the test of time. 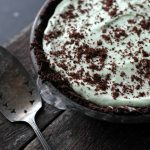 If you haven’t heard of Grasshopper Pie, it has a chocolate wafer crumb crust with a silky green filling, flavored with Crème de Menthe. I knew somewhere in our family recipe collection we must have had a recipe for Grasshopper Pie. I have my maternal Grandmother’s recipe box and came up empty but my Mom produced a recipe card sure it was from the 1950’s (I think probably 1960’s). When I initially read the ingredients, I confess I told her ‘this sounds really gross’. She agreed it did on paper but recalled they found it ‘all the rage’. I was dubious while making it, imagining some goopy, sticky mess from the marshmallows feeling this could not be taking me anywhere I wanted to go. Not so. Much to my surprise by the end of the preparation, the inside of the pie was smooth and flavorfully minty from the Crème de Menthe; not too overpowering nor sticky in the least. Made me want to put on a shift dress, pour a martinimartini and listen to jazz music….OR board a flight on Pam Am to travel somewhere exotic with the rest of the beautiful people of the day. I did a slight variation to these instructions myself when realizing the volume of the original recipe was not enough for my pie. I had frozen the initial amount of filling with the crumbs on top then added the extra filling amount I needed to fill the pie. This created a crumb ‘stripe’ that I actually liked for the texture. If you wish to do this you could fill the pie half full, add some of the crumbs, and freeze it, reserving the remaining filling in the refrigerator. When the pie is frozen, add the rest of the filling and sprinkle with crumbs. Freeze. Today marks the one year anniversary of starting my blog. I am always low key about my own birthday, preferring to quietly observe the magic of the day rather than to be the center of it. I could not let this day pass however without sharing my extreme gratitude. Recently a blogger friend went back to read my very first post, in font too small with no photos, and made the only comment the post has gotten. It touched me deeply and caused me to recall why I started this. My goal was to share the wonder and beauty of food I’ve felt my entire life, most recently from my local surroundings. I had no idea if it would be of interest (well I knew it would a bit from friends asking for my resources frequently) nor how it would play out. If you are reading this you have been an integral part of me ending up here a year later. This journey has introduced me to extraordinary people, new food and drink, wonderful opportunities, and stretching myself in a rewarding way defying description. Recently a good friend and enthusiastic supporter from the beginning asked me ‘so where do you think this is going?’ I told him I had no idea it would lead me here so could not predict where it would go next. Wherever that might be, I am so grateful you have been and hopefully will be with me! Thank you from the bottom of my locavore heart. 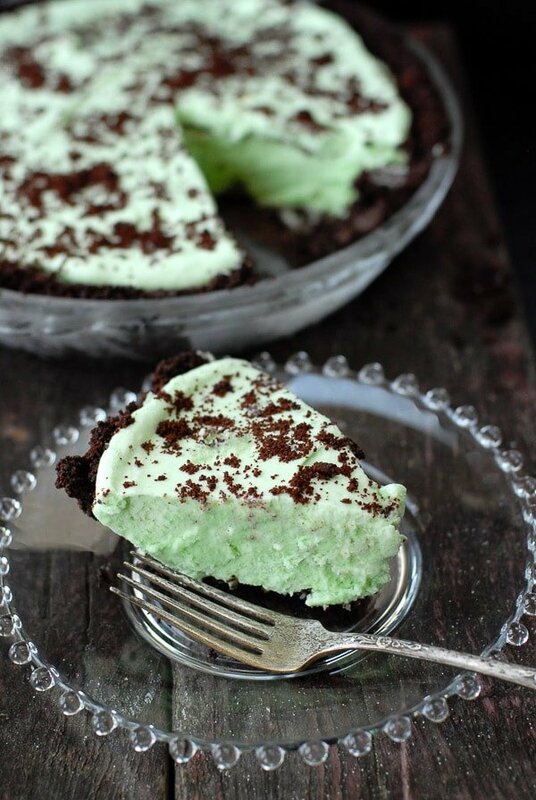 This fluffy, no bake frozen Grasshopper Pie recipe is sure to become a favorite! 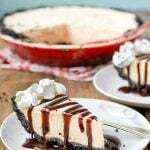 Chocolate cookie crust, light minty filling, makes for a unique pie for any season! 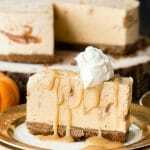 This Grasshopper Pie recipe has been a family favorite as long as I can recall and is now for my children as well. There is not a holiday that passes when not I’m begged to add it to the menu! Refreshing, light, creamy mint filling and a chocolate cookie crumb crust; who could ask for more?! The grandmother and mothers always made it with traditional chocolate wafer cookies (gluten). My version is gluten-free and it’s a very flexible crust recipe to accomodate any chocolate cookies! My grandmother and mother always made the Grasshopper Pie recipe with traditional chocolate wafer cookies(gluten). My version is gluten-free. The crust recipe is very flexible and can accomodate any chocolate cookies! A fun CRUST TIP: I’ve also made the Grasshopper Pie recipe with chocolate sandwich cookies! Too busy to scrape the creamy center out of the cookies to yeild just the chocolate cookies, I throw the entire cookie into my mini chopper in a few small batches (or food processor) to pulverize into crumbs. They work great! I used Glutino brand chocolate sandwich cookies (though I’m sure any gluten-free or gluten brand will work) and it requires about 1 1/2 packages. Gluten-free and gluten cookies absorb the melted butter differently but because it’s a frozen pie it won’t matter! The consistency of the crust will look like wet sand. As mentioned, this recipe has been made in my family by multiple generations. When I began to make it to my mother’s recipe card I found the ingredients worked perfectly each time. Over the past ten to fifteen years I’ve been making it for my family however, I’ve been surprised to find one time it’s fine and the next time there will be way too much filling. As I started to research what was happening I found the sizes of marshmallows have changed, the sizes of the packages have changed, and the sizes can vary between different marshmallow producers making it difficult as a recipe writer to provide precise amounts to allow the perfect amount of filling with no extra! Even the name of the size of the marshmallows change. Each time I make the recipe I try to record any variations and update the recipe. I’ve linked to the size of marshmallow I use (it’s what I would think of as normal, when the only other size was miniature). I realize between multiple brands, and if you are trying non-traditional marshmallows, the results may vary. This recipe is VERY forgiving! The recipe yields a very fully filled pre-frozen pie. A TRICK I USE BEFORE PUTTING THE PIE IN THE FREEZER (or even filling it) is to put it on a baking sheet. It allows a sturdy surface to keep the pie level. If you find that you end up with a bit more filling than will fit, don’t worry! Freeze what you have and it will be light, fluffy and delicious. Our original family recipe was for a traditional, smaller, non deep-dish pie pan. I’ve included both the current day, deeper pie pan ingredient amounts, as well as the ingredient amounts for the original recipe. The instructions are the same for both. whisk. For making cookie crumbs I like using a mini chopper or a food processor works great. 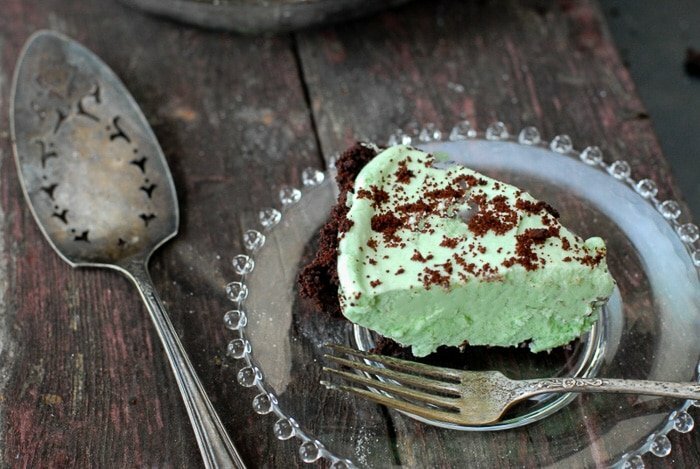 If you’ve tried this Grasshopper Pie recipe or any other recipe on BoulderLocavore.com please don’t forget to rate the recipe and let me know where you found it in the comments below, I love hearing from you! This light, silky mint and chocolate pie is a classic. Being a frozen pie, it's very forgiving. I've included our original family recipe for a small pie and ingredients for a more modern size. Due to the changes in marshmallow sizes if you end up with some extra filling, don't worry! You can freeze it separately for a minty treat! Butter the pie pan. In a large bowl combine the chocolate wafer crumbs (reserving 1/4 cup for topping) and melted butter. Hand stir until combined (the crumbs will look ‘wet’ but it won’t necessarily be sticking together unless using gluten-free crumbs). Pour crumb mixture into the pie pan. Using the back of a large spoon or fingers, press crumbs into the pie pan evenly on the bottom and sides to form a crust. Place in the freezer. Combine the marshmallows and Half and Half in the top of a double broiler OR in a metal, heat-proof bowl placed over a sauce pan of boiling water (not touching the water). Cook, stirring constantly once marshmallows begin to melt, until the marshmallows have melted completely. TIP: using a whisk at the end is helpful to ensure the marshmallows are completely liquified. Remove from heat. Add the Crème de Menthe into the marshmallow mixture and stir or whisk to combine. Note: the Creme de Menthe may settle in the bottom of the bowl but will be further incorporated in the last filling step. Allow the mixture to cool slightly, about 10 minutes. Using a standing or hand held mixer, whip heavy whipping cream until firm peaks appear. Fold/stir into the green marshmallow mixture. Whisk lightly at the end as needed to ensure the mixture is combined well. Pour into prepared pie crust (TIP: place the prepared crust on a baking sheet if needed to allow it to stay level in the freezer). Sprinkle the remaining 1/4 cup of cookie crumbs on the top and place in the freezer. Freeze until firm. **Marshmallow sizes seem to continually change. The size marshmallows used for this pie are what have been traditionally been known are 'regular' as opposed to mini marshmallows (or large or jumbo). Now that there is an increased range of sizes and brands I've added a link to the type of marshmallows I typically use in the recipe as a guide. LOL! Those were the days! I will say I do let my kids eat the pie and never thought about it due to the (little) amount of alcohol….probably because my mother and grandmother made it when I was a kid! Hi Carleen. This recipe is how my mother, grandmother and now I make the pie. We’ve never used Creme de Cacao as used in the Grasshopper cocktail. 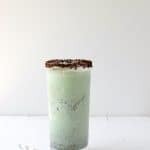 The peppermint-chocolate combination which the defines Grasshopper Pie are achieved between the minty filling and the chocolate cookie crumb crust! Hope that helps. I’m so glad you still had that file of recipes! My grandma used to make this too and I have fond memories of her serving it at Thankagiving. I always think of it at this time of year. I’m so happy to know that Mary. We never actually ate it at Thanksgiving until I made it one year and my kids insist I make it every Thanksgiving now (in fact I just ate a piece). Don’t you love having those treasured recipes? I always find it a bit mind blowing that I’m making something my grandmother and great grandmother did too! This looks really good but I don’t eat marshmallows. Can fluff be substituted? Hi Lisa. The marshmallows are melted as you see in the recipe and really they have the same consistency as marshmallow fluff it it’s a texture or form concern. I have unfortunately only made the recipe as written. If you do experiment with making it with fluff please let me know how it turns out! The first time I ate grasshopper pie was in high school. I was in heaven! I asked my friend for the recipe and she said it was a family secret. Forty plus years later, I’ve come across your website and the recipe looks like the real deal! Love the story and history behind the recipe and the photo of the yellowed-with-age recipe card. Thank you very much for sharing. Congratulations on your anniversary and please continue your good work! Well thanks to the internet and Pinterest, there are no such things as ‘family secret’ recipes any longer! Unless it’s a secret between 10,000 of one’s closest ‘frineds’. We simply love this pie in our household. It was an infrequent but coveted pie in my childhood and now that it’s been pulled out of mothballs, my children in particular adore it and have committed it to our Thanksgiving march-of-pies never wanting to miss a chance to have some! I hope it will mirror your memories. Once the pie is frozen firmly, can you keep it in the fridge? Or is it intended to be an ice cream pie? Great question Simone! It is a frozen pie so should remain frozen for its (usually, very short…) life. This pie was amazing! We traditionally celebrate St. Patrick’s Day with Corned Beef and Cabbage and top it off with some kind of “green” dessert. I found this recipe and it was so delicious! I did add a layer of fudge to the bottom of the chocolate pie crust! I will definitely be making this again and will share this recipe with all of my friends! Thank you!! Sharyl I’m so glad to hear all of this and love your fudge idea! This certainly isn’t Irish but I got a request from my family this weekend to please make it for St. Patrick’s Day tomorrow! I really appreciate you taking the time to tell me about your experience! OOO that looks amazing! Mint chocolate chip is the best! Congratulations all the way around. Yummy recipe and I had to laugh when I read “shift dress”. I haven't heard that in years! Happy anniversary Toni! I'm sorry my greeting is a bit belated but I was busy turning a year older myself on the 26th. Looks like I am in good company. Now, great recipe and beautiful photos. I love Grasshopper Pie and haven't had any in too long. Just seeing the photos caused an instant flashback! Great post. I was on Photograzing looking for a Grasshopper Pie recipe and your recipe popped up. I had a wonderful slice at Baked Brooklyn in Red Hook last month…but we moved to Denver two weeks ago and traveling 2,000 miles for a slice of pie seems a bit excessive. This looks like it will do the trick! Mmm the color of this pie looks amazing! Yum! Congratulations on top 9! This looks refreshing and delicious! It takes me back to my sorority days because we had a dessert like this for special occasions! I will bookmark this recipe and make it as a surprise next time I get together with some of my sorority sisters! Congrats on being in the Foodbuzz Top 9!!! Thats a really greta looking pie! A lovely post — beautifully written. And what a pie! I remember it well, eating it, not making it. I'm almost tempted. And I certainly remember Pan Am. Only recently did I hear airlines complain about the customers not dressing up anymore. Congratulations. Your pie is beautiful! Vintage recipes, especially from family, are the best (even if they sound gross at first). Congratulations on your blogiversary and making the Top 9! You Go Girl! Congrats on the Foodbuzz Top 9! Congratulations on your blog-aversary! Your blog has been host to many beautiful dishes in the past year! 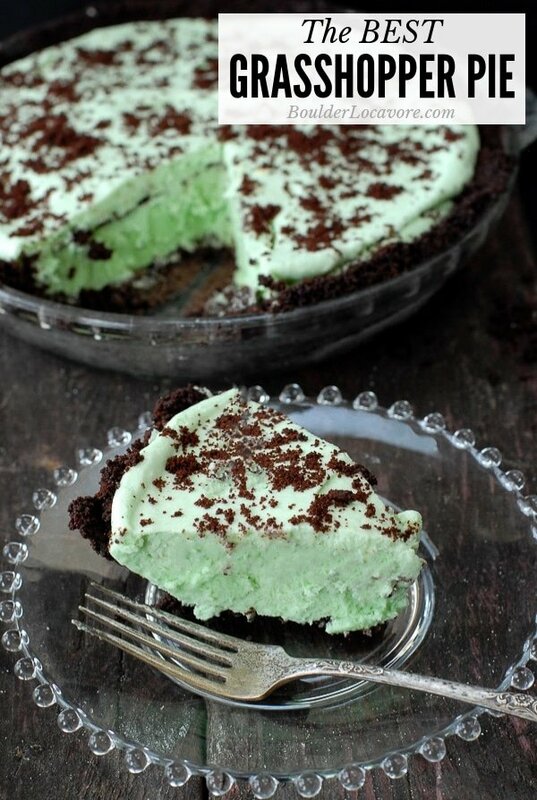 Grasshopper pie is a great dish for your Pan Am show. I remember it from my childhood. I begged and begged my father to make it (lured in by the name and the green color from and old cook book he owned) and one day he finally did. It was awesome. Thanks for reminding me. Happy Anniversary Friend! I have enjoyed this journey with you. I can't wait to see what you inspire me with this coming year! I love your pie and your plates – I collect candlewick dishes too. You’re so cool Toni!! I am glad you are my/our friend. Best of luck with all of this and I am sure your considerable talents will take you far! We’ll be watching…and cheering! I had that once a long time ago. As for Pan American they were quite the airline. I still have the wings (someplace) a stewardess gave me. I had been looking and looking for a grasshopper pie recipe a few months back. I'm saving this one. Thank you! What a fun party idea. I think my mom had a very similar recipe card in her files too.